Coronary angiography and intervention with a radiation generation device is the gold standard for diagnosing and treating coronary artery obstructive disease. The acquisition of a qualified image is considered the cornerstone for making an exact diagnosis and successful interventional procedure . From the aspect of image quality, the general rule of X-ray is that the higher the dose, the better the image quality. However, higher radiation is limited by safety concerns . There are numerous kinds of radiation toxicities related to exposure or susceptibility to radiation: skin erythema, cataracts, bone marrow suppression, sterility, and development of cancer or other adverse genetic alterations. For these reasons, radiation hazard has become an emerging health issue in the area of interventional cardiology. 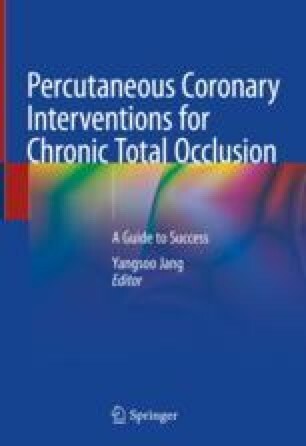 Especially during the percutaneous coronary intervention (PCI) of chronic total occlusion (CTO), both the medical staff and patients would inevitably be at risk to higher radiation exposure than simple and less complicated interventional procedures. Multiple factors influence radiation exposure to medical staff: procedure complexity, radiation protection employed, individual patient’s anatomy, physician's experience and habits, as well as vascular access site [3–6]. In addition, there might be a considerable difference in emitted radiation dose between the type of angiography equipment including mainly X-ray machines and dose protocol. Therefore, an effort by the operators to reduce excessive radiation dose to a level that gives appropriate diagnostic image quality without excessive exposure is beneficial .